Native Range: Mobile Bay basin, including the Coosa, Cahaba and Alabama river drainages, and possibly the upper Black Warrior River system (Lee et al. 1980 et seq. ; Page and Burr 1991). Table 1. States with nonindigenous occurrences, the earliest and latest observations in each state, and the tally and names of HUCs with observations†. Names and dates are hyperlinked to their relevant specimen records. 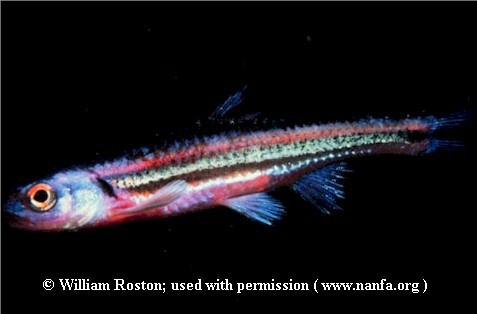 The list of references for all nonindigenous occurrences of Notropis chrosomus are found here. Means of Introduction: Unknown; possible bait bucket release (Starnes and Etnier 1986). Status: Established in Alabama; possibly established in Georgia. Remarks: Lee et al. (1980) listed this species as native to the Mobile Bay basin but noted that it was possibly introduced into the Black Warrior. Swift et al. (1986) listed it as "native, possibly introduced" to the Black Warrior system. Page and Burr (1991) apparently considered it native to the Black Warrior drainage. In their summary table on Alabama fishes, Mettee et al. (1996) listed it as native to the Black Warrior River system. Starnes and Etnier (1986) considered the presence of this species, and also Fundulus stellifer, to represent "recent accidental (bait bucket?) introductions" into the South Chickamauga Creek system (Tennessee River drainage) of Georgia. These two species occur together in small streams and could easily be taken by individuals seining for bait and subsequently transferred. In a footnote to their table summary of Tennessee fishes, Etnier and Starnes (1993) stated that this species is present in the Tennessee River drainage in northern Alabama (native?) and Georgia (introduced?). The Tennessee River drainage site in Alabama is mentioned as being Town Creek near Fort Payne. Within the state of Tennessee, Etnier and Starnes found it to be confined to tributaries to the Conasauga River (Mobile basin). Mettee et al. (1996) noted that isolated populations exist in two sites in the Tennessee River drainage in Alabama, the Town and Short creek systems. They do not discuss the possibility the possibility of introduction. In our opinion, the records from the Tennessee River drainage in Alabama and Georgia represent introductions. The Town Creek site (northern Alabama) is considerable distance from the drainage divide where a stream capture would be expected to occur. If it was in the Tennessee drainage via stream captures, then the species would likely be much more widespread. That region has been fairly well sampled, so if it were more widely distributed then it would most likely been collected. Reports of this species as possibly introduced into the Black Warrior system are questionable. We base this on the fact that N. chrosomus is typically found in streams with limestone outcrops in the watershed. Based on the distribution map given by Mettee et al. (1996), it is found along the southeast edge of the Black Warrior system. These are streams that have their headwaters in limestone formations. It likely entered the Black Warrior system via stream capture a long time ago or, if introduced, was transplanted by Native Americans. In their report on Georgia fishes, Dahlberg and Scott (1971) made no mention of the occurrence of this species outside the Coosa River drainage. Mettee, M.F., P.E. O'Neil, and J.M. Pierson. 1996. Fishes of Alabama and the Mobile Basin. Oxmoor House, Inc, Birmingham, AL. Page, L.M., and B.M. Burr. 1991. A field guide to freshwater fishes of North America north of Mexico. Volume 42. Houghton Mifflin Company, Boston, MA. Starnes, W.C., and D.A. Etnier. 1986. Drainage evolution and fish biogeography of the Tennessee and Cumberland Rivers drainage realm. Pages 325-362 in Hocutt, C.H., and E.O. Wiley, eds. The zoogeography of North American freshwater fishes. John Wiley and Sons. New York, NY. Swift, C.C., C.R. Gilbert, S.A. Bortone, G.H. Burgess, and R.W. Yerger. 1986. Zoogeography of the fishes of the southeastern United States: Savannah River to Lake Pontchartrain. Pages 213-266 in Hocutt, C.H., and E.O. Wiley, eds. The zoogeography of North American freshwater fishes. John Wiley and Sons. New York, NY.